It’s a nice feeling when you set an alarm for something that doesn’t entirely dissapoint. The objective was to back up Northern Coaltion. and Pandemic Horde who were supporting Seige Green in defense of a lowsec fortizar in Matari Lowsec space against a determined assault by Goonswarm Federation. 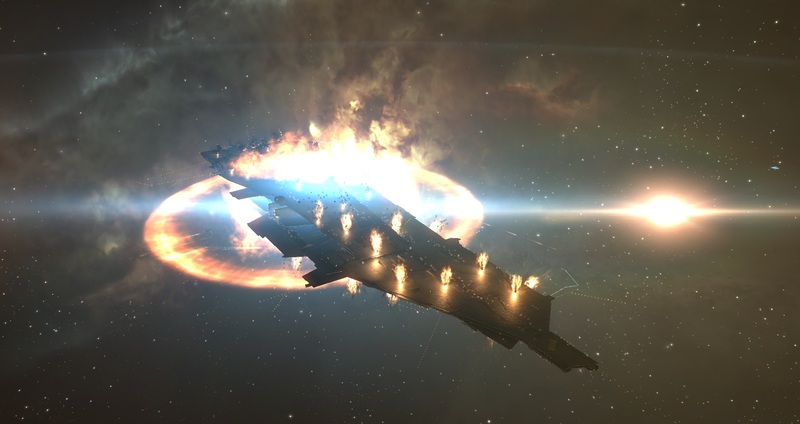 They committed Ferox, macharials, and support ships as well as Snuffed Out who brought the bulk of the attacking capitals which included carriers and 3 Titans on grid. Our initial warp into the fight was cut short by a rapid series of FC headshots which may or may not confirm that spying is alive and well or that somebody is simply taking notes on the other side as to who FC’s in the AUTZ. Backups stepped up to replace the anchor and broadcasts continued. The second round saw Seige Green committing Dreadnoughts and Carriers in a close-quarters fight with the Snuff Titans in which the Titans had the better of it. After this the objective had clearly been lost, though we continued to snipe as many of the attackers as feasible before being the last of the defenders to depart grid. At least we got to shoot something this time, even if it was brick wall. I still can’t help but observe that FPS crashes are becoming distressingly all too common with as little as 700 players on grid. I’ve been browsing on-line greater than 3 hours as of late, but I by no means found any interesting article like yours. It¡¦s lovely worth sufficient for me. In my view, if all webmasters and bloggers made excellent content material as you probably did, the net can be much more helpful than ever before. hello there and thank you for your info – I have certainly picked up anything new from right here. I did however expertise several technical points using this site, since I experienced to reload the website lots of times previous to I could get it to load correctly. I had been wondering if your web host is OK? Not that I am complaining, but slow loading instances times will often affect your placement in google and could damage your high-quality score if advertising and marketing with Adwords. Anyway I am adding this RSS to my e-mail and could look out for a lot more of your respective intriguing content. Ensure that you update this again very soon.. Wonderful site. Plenty of useful information here. I am sending it to a few buddies ans also sharing in delicious. And naturally, thanks in your sweat! It is in reality a great and helpful piece of information. I¡¦m satisfied that you shared this helpful information with us. Please stay us up to date like this. Thanks for sharing. Hello, Neat post. There is an issue together with your website in internet explorer, would check this¡K IE still is the marketplace leader and a good portion of other folks will miss your fantastic writing because of this problem. Wtb5ft It as not that I want to replicate your website, but I really like the style and design. Could you tell me which design are you using? Or was it custom made? Thank you for another excellent post. The place else may just anyone get that kind of information in such an ideal approach of writing? I’ve a presentation next week, and I am at the search for such info.